Glasgow’s original curry king, Balbir Singh Sumal opened the Ashoka in 1973, later selling to colleague Charan Gill who went on to build the Harlequin Restaurant Group while crediting Balbir as his mentor. Balbir made a significant return to the scene with the opening of Balbir’s on Church Street off Byres Road in 2005, which was followed by the Saffron Rooms by Shawlands Cross last year. Now, just west of Charing Cross, his new Tiffin Rooms are tall, bright and rather elegant. Black wooden tables are comfortably spaced on a blonde wood floor. The front is dominated by huge, rough-hewn sandstone pillars and half a dozen large succulent plants. These days, tapas-style eating is everywhere but Balbir has always carried a good reputation for his starters and tasters, so the introduction of tiffin – an Anglo-Indian word for light meals served throughout the day – seems an obvious move. The food is unpretentious, fresh, fragrant and adventurous with a lot of locally sourced ingredients. Balbir understands how tastes are changing and how much ghee goes into the average curry. The turning point came when his father died of a stroke and he started to think more about healthy eating. So, his kitchen uses low-cholesterol rapeseed oil while cream, butter, sugar and salt are used sparingly. The result is good food that’s good for you. Three chefs from India have brought new ideas straight from the dhosa houses and grill rooms of Mumbai. A delicately flavoured, vegetable tava prepared on a sizzling griddle is, apparently, a firm favourite with Bollywood stars. There are mussels in garlic and coriander soup, kebabs and lamb patties – soft little burgers made with ginger, garlic, chili and gram flour, dressed with tamarind chutney and raita, as well as familiar Balbir’s favourites such as blackened salmon tandoori and Mrs Balbir’s bhel papper – a mix of rice, spiced gram flour, lentils, nuts and chutney that’s like moist Bombay mix with pulses. Good dhosas are hard to find in Glasgow (it’s not a Punjabi dish) but here they are crisp and filled with minced lamb, chicken or vegetables with a crunchy coconut cream and a light yellow dhal with fresh curry leaf and mustard. 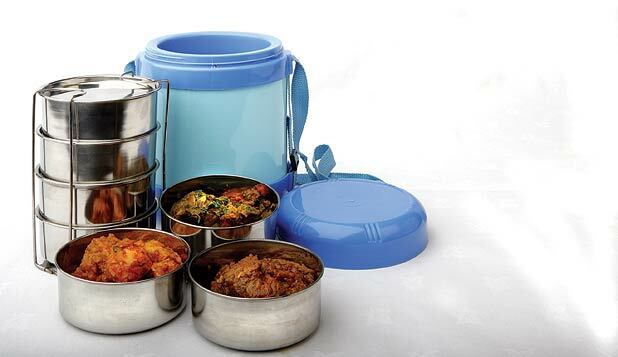 The tiffin dishes fill one side of the evolving single sheet menu. On the reverse, a selection of curries are offered either, as part of a thali-for-two deal, as single dishes, or as platter meals with rice and bombay potatoes. For a substantial meal, you’re encouraged to mix and match as the curries come in tiffin-size portions, but this also suits the bistro style of light meals available all day. Monir Mohammed’s homestyle ‘desi’ cooking was quick to pick up on the trend to smaller plates, and his first foray to the east has been a hit with capital diners, revitalising a useful if slightly tucked-away location near the University. Stylish tiffin boxes are used to serve smaller dishes at lunch times as well as for bar snacks (all the way through to 11pm) at this sweeping West End venue, recently taken over by Ryan Singh (of Mr Singh’s Restaurant in Glasgow). A slick new arrival in the Merchant City, claiming to be Scotland’s first restaurant dedicated to thali: chose a ‘base thali’ and you’ll get rice, naan, salad and daal, to which you can add two or more katoris (individual thali dishes).